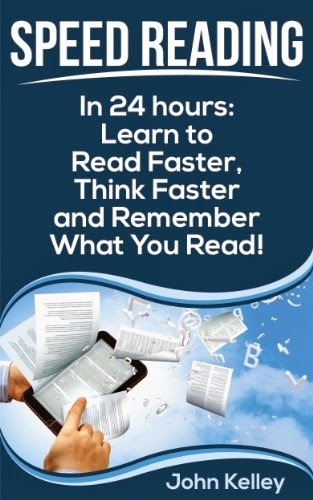 "Speed Reading: In 24 Hours: Learn to Read Faster, Think Faster and Remember What You Read" is a recently-published Kindle Ebook by John Kelley about the requisite skills, practice, and applications of speed reading. Kelley's book is designed to benefit high school, college, and adult students who can apply his techniques to their schoolwork and in their professional careers to gain a competitive edge. The book follows Kelley's five basic steps, beginning with "isolating the trouble" using practice tests that assess rate, comprehension, page response, fast thinking, and vocabulary. Readers are encouraged to calculate their individual scores and to chart their progress in their Profiles. Next, readers learn the basic techniques of speed reading, such as analyzing paragraph structures, as well as more advanced abilities, such as speed reading while maintaining a high comprehension level. All the while, there are exercises devoted to practicing these new frameworks and an answer key to "verify your success." Lastly, Kelley encourages his readers to apply his techniques to all reading material, and he acknowledges that speed reading is a skill that can be honed throughout one's life. The book is most interesting in its broad approach to cultivating one's speed reading ability by teaching multiple components of the task. Overwhelmingly, "Speed Reading: In 24 Hours: Learn to Read Faster, Think Faster and Remember What You Read" is a successful "how-to" manual for learning and improving upon one's speed reading.